We’d love your help. 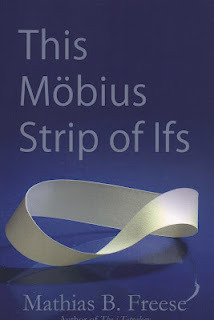 Let us know what’s wrong with this preview of This Mobius Strip of Ifs by Mathias B. Freese. In this impressive and varied collection of creative essays, Mathias B. Freese jousts with American culture. A mixture of the author's reminiscences, insights, observations, and criticism, This Mobius Strip of Ifs examines the use and misuse of psychotherapy, childhood trauma, complicated family relationships, his frustration as a teacher, and the enduring value of tenacio In this impressive and varied collection of creative essays, Mathias B. Freese jousts with American culture. A mixture of the author's reminiscences, insights, observations, and criticism, This Mobius Strip of Ifs examines the use and misuse of psychotherapy, childhood trauma, complicated family relationships, his frustration as a teacher, and the enduring value of tenaciously writing through it all. Freese scathingly describes the conditioning society imposes upon artists and awakened souls. Whether writing about the spiritual teacher Krishnamurti, poet and novelist Nikos Kazantzakis, or film giants such as Orson Welles and Buster Keaton, the author skewers where he can and applauds those who refuse to compromise and conform. To ask other readers questions about This Mobius Strip of Ifs, please sign up. Another coupling of essays shares the profundity of his mind. In one titled "About Caryn' he praises his daughter stricken with Chronic Fatigue and Immune Dysfunction Syndrome (CFIDS) for the courage she demonstrates in coping with her station in life, and that essay is followed by `I had a daughter once' in which he describes Caryn's suicide (`she rotted for a week before someone inquired about her.') and the grieving a father for a daughter has rarely reached such heights of profound tenderness. This is one of those books that belongs in the library of every thinking and concerned human being. It is a treasure, at times exceedingly painful to read, at times exhilarating. Highly Recommended. I have to be honest and confess that I haven’t heard of Krishnamurti and Kazantzakis, nor am I particularly motivated to research them, so references to them did go over my head just a tad. The author, however, is clearly an adherent. Nevertheless, I found Freese’s writing fascinating and awe-worthy. What I found a little strange, however, was that he describes himself as a ‘private person’, but I thought the essays were quite soul-baring, which perpetuated a mystery through the whole reading experience: for whom was he writing, himself or the reader? This is a book to be reread: there is a quality and depth to the writing which can’t be grasped instantly (but that may be my own inadequacy, of course). It is also one that can be ‘dipped’ into at intervals. I still haven’t been able to get it out of my head, and therefore, the author may be able to shout ‘Success!’. Mathias B.Freese is a former psychotherapist and teacher, and though he shares some of those experiences, this is no dry academic text. His essay collection is a rich concoction of stories, feelings, dreams, ideas, perceptions, and distilled memories. By sharing his own emotionally deprived childhood and family losses, he touches a core in all of us who’ve considered our early years and/or have gone through the pain of losing those we love. And he doesn’t flinch when he shares his regrets or his Mathias B.Freese is a former psychotherapist and teacher, and though he shares some of those experiences, this is no dry academic text. His essay collection is a rich concoction of stories, feelings, dreams, ideas, perceptions, and distilled memories. By sharing his own emotionally deprived childhood and family losses, he touches a core in all of us who’ve considered our early years and/or have gone through the pain of losing those we love. And he doesn’t flinch when he shares his regrets or his inability to make those tender family connections that we all crave. In doing so, he shares his humanity. But This Mobius Strip of Ifs is much more than a compilation of personal reflections. Through discussing the people who’ve had an impact on him—like Jefferson, Freud, Buster Keaton, Orson Welles, and the writers, Camus, Krishnamurti and Kazantzakis, he encourages us to look at our own lives. As he weaves in his encounters with these great men and others through film and books, he raises those big questions we all ask ourselves. What is our purpose? What is of value? What are we teaching our children in schools? What are we giving them at home? How do we get over our mistakes, our regrets in life? Can we? And can we ever know ourselves? A psychotherapist for 25 years, Mathias B Freese conveys a unique combination of psychodynamic thinking and Eastern philosophy while examining existentialism, alternative education, and Jewish values. His award-winning novel, The iTetralogy, is a groundbreaking contribution to Holocaust literature. His short story collection, Down to a Sunless Sea, was published in 2008. In 1974, Freese attempted to publish a story, but by mistake it came out under a different name. When he wrote and informed Martha Foley about it, she promised to correct him but died before she could do so. Freese reflects a little on his life and loss of his wife and daughter and how a kind note from the editor held him up during rejections of his manuscript and so forth. In life there is no resolution but only endless struggle. He begins the essay about students who don't know who King Kong is. Then he goes on into how students are ignorant and that they lack knowledge of film and of books. All students focus on is getting ahead and that the creativity in schools is being killed. He then moves on to talking about teachers and how schools are declining because they're not demanding anything from the students. He calls for action and for people to begin to care. When he was in his 20s, he read Peter Gay's biography of Freud and mentions what impressed him the most about the book. In his 40s, he begins college and gets an instructor that talks negatively about Freud's attitudes towards women. When asked to provide which works of his talk this way, the instructor is not able to mention them. The author is impressed by Freud and describes a little of the lifestyle. Freud will not go away and more accomplishments of his are mentioned and how the author is in awe of Freud. The author managed to procure some of Freud's works and enjoyed reading them. Freud tackled many issues. Mathias shares two anecdotes and ends with a reason why he likes Freud. Chaplain McCroy asked him to speak in 2007, and he mentioned that today he has to be careful and to speak with truth and force. He mentions some of the writer's tasks, such as to see, to speak from the heart and to get truth free of conditioning and self-censorship. "One scholar wisely compared the Holocaust to a terrible train wreck; people wounded, dead, some wandering about in pain and confusion. It depends where you are in the train wreck; this determines your perspective, your feelings." (59) In his opinions, people are not experts on themselves much less than Holocaust. He goes on how people must remember on this particular day. He also mentions some observations, that man is a killer, altruists are rare and man is a forgetful creature and the man repeats. In truth, you don't know who will do what. He goes about how Man has a Nazi inside of him, and gives caution against ourselves, how schools should teach children to see inwardly. Discussion of trains that were used to deposit Jews at death camps, followed by a discussion from his novel titled Tetralogy about a character titled Gunther and the obsession of trains that the author has as well as Gunther, how no one knew the truth about it. He then goes back further in time recalling how his uncles bought trains for him 50 some years ago as well as how much he enjoyed the trains. To get more money for Bar Mitzvah, the train set is sold. He feels the need to go back to that particular hobby and he begins to buy things about trains on ebay. He then recites a poem from his book, Gunther's Lament. He begins with saying that Steven Spielberg helped kill Orson and writes about a meeting (imaginary, maybe, not sure) about them meeting and a sled and a conversation they had. The section is also where the author supposes what Orson would do should he continue to live longer. The author then imagines Orson Welles' life in heaven, what he would do and what he would be given. The ending of the essay is somewhat mournful as events are impacted in real life. He begins with a description of the Kodak Bantam Camera and of how things moved from film to digital cameras. Childhood memories begin to creep in, of him, his sister and his father. He passed on the camera to his son Jordan, along with Nikon FE, which he bought in 1979 and used it for two decades, making sure to include himself in pictures. In 1999 Rochelle passed away and he had to find a new way to relate to his son. He imagines that the cameras are people who are talking about their own experiences. More descriptions of pictures and of himself are given. "Photography and writing are sisterly arts, one writes with light, and the other writes of life. Both reveal much more latently than manifestly- if one sees." (139) He goes on into contemplating death, and recalls the death of his mother from ovarian cancer and how tired he is of life. Quick notes: I would like to thank the author for the opportunity to read and review the book. What if everyone lived within the inside of a box so thick that they could not see what was behind the corners or upper lid and never realizing what lies behind the confines of this box? What if you world was so fragile and breakable that all you see is what is right in front of you and not what is around you? What if you lived inside the shell an uncooked egg and each time you moved around just a little bit of the shell came apart and what you begin to see is not what others want you to see but what is really there? For the first time you view the world, slowly at first and then when the entire shell cracks and is no longer protecting you within its shell you begin to see, question, listen and explore the amazing world that has been hidden from you for so long? What if students were encouraged to asked questions and received more than just the expected or canned answers written in the teacher’s edition of a textbook? What if students were actually taught not spoon-fed and required to seek what is deeper than what appears on the printed page of a textbook that is outdated as soon as it is printed. New information is recorded daily on the net, new research is done everyday and textbooks are only current until a new one is written and more information added which outdates the first but soon that one too. What if teachers were allowed to teach without the constraints of curriculum guides, paperwork and text? What if students were encouraged to become more aware of whom they are and what they want to be rather than what is expected of them? What if students were not consumed with grades, getting ahead, money and become their own person without being victims of the world created for them by their parents and friends. What if teachers like our author did not become frustrated by having to tell his students rather than have them inquire? What if he could actually engage them and not watch them take notes or hang on his every word? What if educators actually challenged their students and allowed them to master things on their own? Teachers as he relates seen confined, distrusted and are not empowered. Aging has taken its toll in the author as it does with most people. Defining and observing the changes within his physical appearance, his attitude and perspective is shared with the reader in Chapter 2. No one asks to age or get older. You hope to but the changes we see are not always what we want to accept but we have no choice. Two books published is definitely a great accomplishment. Making something of his life he certainly did. Sharing with the reader that he overcame obstacles, adversity and life’s difficulties might encourage more to take on his way of thinking and understand the meaning of his What ifs. Chapter 3 he shares his view on how he lives his life untidy and a great email from a student. The Unheard Scream is a letter that he addresses to all of his students trying to explain what they should be looking of in life, searching for their own answers, not taking just what we give them as gospel and learning to think about “ what they will do here on earth?” Have you ever asked a young person what or where they see themselves in ten years? You might be surprised of not so surprised at the answers you will get. An artist creates a picture or painting defining his work through his art. A therapist the author states should be well read in art, music and literature. The many definitions and references to his vocation are interesting as he sates as a therapist he is an outsider. I often get the feeling as I read each essay that the author places a different part of him within the framework or structure of the theme presented. Throughout this chapter he allows the reader to share his profession, explain his role and how the therapist uses himself as an instrument. As the layers unfold you begin to feel that each part is a separate scene in a movie or special documentary dealing with each aspect of this thinking, vocation and perspective on life. As he tells the reader about the impact a client has on him and how the client is the best facilitator of information helping the therapist understand not only the needs of the client but the therapist too. The Ten Canons explained on pages 36-38 are almost ten ways to deal with pain, remorse, lies and self-esteem. Mr. Freese includes some well written, straightforward essays that express his viewpoints and thoughts on many topics. I don’t think he is trying to sway the reader into thinking his way or convincing you that you have to agree with his point of view. Frustrated with the teaching profession he airs his views and explains in many chapters that students were primarily concerned with grades, when and if they will graduate and what monetary value can they attribute to the careers that their parents might have chosen or someone at the school might have suggested. He included essays on Buster Keaton, Peter Lorre, Orson Wells and Kaszanstakis. For lovers of movies and books you might want to read “Babbling Books and Motion Pictures.” What if what you were taught as a child was wrong and has no bearing on what you need to help you in life as an adult? Simply stated in one sentence: The task of each one of us is to be free of the other and ultimately free of one’s own inner constraints.” Self-awareness and thinking for yourself without being programmed by the schools, parents and your friends would be quite compelling and interesting to see how students would handle being able to think more critically and intuitively on their own. Essays about his family discusses his early life, his childhood, his middle years and an aging grandparent, a daughter with Chronic Fatigue and Immune Syndrome and essays that reflect the many stages of his life. Uncle Seymour who had a powerful impact on him and who allowed him to finally learn to accept and express his own thoughts and emotions guiding him to become a therapist. Added in we learn about his divorce, his thoughts about Freud, experienced as a therapist and how he came to find and learn his own personal truths. The second half of the book Metaphorical Noodles includes the work of many actors and filmmakers who strived for the same things students should in school artistic or educational freedom. In the movie business directors and producers strive to create movies as they see it or the writer sees and often the actor’s thoughts and creative input are pushed aside. Within the third section we learn more about his daughter Caryn her struggle with Chronic Fatigue Immune Syndrome and taking her own life. Losing his wife in 1999 in a car accident and his Grandmother Fanny whose story you need to read and his Uncle Seymour whose many actions described will definitely surprise the reader. In I Had A Daughter Once the author shares his raw and inner emotions about losing his daughter. “Cameras as Remembrances of Things Past,” allows the reader to understand the power of the lens and how taking pictures can recreate moments in your life, family history and allow you to relive them everyday you look at them. To me it keeps the person alive in your heart and mind giving you your history. What if the cameras and reels of film that you have in your home could speak for you and create their own movie of your life? This final section called Seawall allows the reader to hear the author’s thoughts and share his feelings about his children, losing his wife and his own personal losses allowing the reader to reflect on their own. But, there are positives in his life and his son Jordan brings the light out in the author’s eyes as he is watching him write a screenplay, decide on who is and is watching him find his way as an artist. The final chapter I would like to reflect on is I Really Don’t Know Me and I Really Don’t Know You as the author in this chapter reflects on his life, his downward spiral toward extinction as she says and realizing that he and is son are blind toward each other. Relating how he walked with his Uncle Seymour to the Jewish bakery to get a rye bread reminded me of sharing a rye bread as a child with my grandfather. What happens to the rye that his uncle bought was traumatic for the author and the total incident will explain why when you read it. He was also the cause of destroying his sense of trust when he tried to teach him how to swim and what happens will surprise you as he thought he was going to have swim lessons but instead he almost drown. Reflections on Rummaging rounds out the book and is the final essay is a final accounting of everything he reflects on in this book while sitting in his garage facing many boxes filled with his life’s history. But, this book allows you to rummage through the mind of this therapist, father, complex man and try and understand your own Mobius Strip If’s? What if we all thought the same way? What do you think would happen? Reflect, ruminate, feel, re-read. Repeat. My two cents: I have been reading this slim book of essays on and off for two months. I couldn't rush through it. It is one of those books that you read a few pages a time, ruminate upon, reread, and then potentially regroup. If you're looking for a diversion or some escape, this isn't it. If you're looking for a something with some real meat, and want to be challenged, provoked ... and you want to feel, then consider picking this up. At times I admit I felt a little embarrassed as I felt that the author was baring his soul, as many of the essays are so deeply personal -- from this thoughts on losing his wife, his reminisces of fatherhood, to his beliefs on how education conditions us, to religion, to his favourite movies ... and even to his skirmishes with book bloggers! - The Seawall comprised of 10 essays mainly about family life and recollections. Whatever the essay, he is uncompromising on his thoughts and beliefs that have taken him a lifetime to ruminate upon and to verbalize through his writings. What strikes me most is that he obviously does not write to please the reader, he writes to please himself. He could definitely piss people off. (And warning: don't expect politically correct language - he calls it what it is!) But then, that is what is so good about this book! You become Freese's reader, student, confidant. He obviously doesn't need you to agree, but he does want to provoke you. As I was reading this, I started remembering conversations with my grandfather where he would say what he wanted to about a life lived. A simple man of few words, the truths that he revealed in those talks still remain with me. Yes, expect some warm fuzzies. And as quickly as I started to warm up to Freese, he turned devil's advocate and transformed into one of my former professors -- someone who challenged me to challenge my beliefs -- making me uncomfortable at the least, even angry, or sheepish as the case may be. On some occasions I agree, on others, it not an agreement without a fight. Other times, it's just a total rejection. You'll feel like you've picked Freese's mind after having finished this! He'll get some reaction from you, I can assure you! The essays that most resonated with me dealt mainly with Freese's family life. I felt immensely sad when he talks about his daughter, her battle with Chronic Fatigue and Immune Dysfunction Syndrome ("About Caryn"), and how he lost her to suicide and ("I Had a Daughter Once"). Coming from a family of educators, I also found the essays on being an educator fascinating. "Teachers Have No Chance to Give Their Best" examines what the education has done to dull, rather than sharpen minds, to encourage conformism rather than vision. I found myself nodding to many of his points and am passing it along. And lastly, if you're a book blogger (read: me), "At Personal Posturings: Yahoos as Bloggers" may be of interest as Freese as an author tells it like it is. It made me laugh out loud. But it also made me realize that book bloggers and authors do a very strange little dance and regardless, are simply human. You'll get nice bloggers and some not-so-nice bloggers ... and vice versa. These thoughts spring from a mere first reading. I am sure that I will be rereading the essays once again and will find some more nuggets in there -- because this is one of those books which you can read and re-read and come out with even more great finds. A challenging, provoking, and entertaining read that will get you thinking and examining your beliefs. An immensely satisfying read if you decide to stop and ruminate. What comes to mind is the old adage: An unexamined life is not worth living. I envy Mathias Freese as he is obviously living and living well. First line: I was casually informed a year after the fact by the editor of Grafitti that my short story "Herbie" published in that magazine was listed in Martha Foley's The Best American Short Stories of 1975 under "Distinctive Short Stories of 1974." Last line: I advocate you rummage for yourself after forty years. The idea of a möbius strip is an interesting one. It's a surface that has only one side and only one boundary component. It's curious because it is so interconnected. If one were to trace the length of the outer surface with a pen, one would eventually end up at the beginning again without ever having to lift the pen from the surface. This has a great allegorical value, as you could view life in the same way: one continuous path that twists into itself and ultimately brings you back to where you The idea of a möbius strip is an interesting one. It's a surface that has only one side and only one boundary component. It's curious because it is so interconnected. If one were to trace the length of the outer surface with a pen, one would eventually end up at the beginning again without ever having to lift the pen from the surface. This has a great allegorical value, as you could view life in the same way: one continuous path that twists into itself and ultimately brings you back to where you started from. In his work This Möbius Strip of Ifs, Mathias B. Freese follows this theme by compiling a group of short stories that he penned over the years, and reflect his musings on various parts of his life. Freese's stories take us through the many facets of his life, from his time as a high school English teacher to his work as a professional therapist to his struggles in publishing essays. Some works are retrospective, looking back on his life (At 76) while others focus on those close to him (The Unheard Scream, About Caryn). Freese often waxes philosophical, and has a great mind for analogy and juxtaposition. His writings are intellectual and have some wonderful truths interwoven among the text. It's hard to pin down an overarching theme that bundles these essays together, but if I had to pick one it would be analysis of self and others. Freese has a critical eye which spares no expense when cutting to the core of what he feels, whether it be about himself, his marriage, or the goings on around him. Perhaps I should have seen this coming, then, when I read the essay entitled Personal Posturings: Yahoos as Bloggers. In its initial volley, Freese compares bloggers to Yahoos, creatures created by Swift in Gulliver's Travels that exemplify humans in their most basic and boorish form. He takes specific aim at bloggers who set goals, specifically goals about reading a certain number of books in a specific time. He labels this "the challenge." The crux of his argument against bloggers is their inevitable lack of intelligence and appreciation for literature, where in reading and reviewing for a blog one could not fully appreciate the mastery which is contained within most classic novels. Additionally, we (as bloggers) cannot stand to review books and give them negative reviews; we would rather not review a book than write a negative review. Additionally (and finally) he describes blogs as an ego-centric outlet for a blogger to express an innate desire for the world to ogle them and post about every aspect of his or her life. Of course, Freese does write that he writes this all in hyperbole, but how much of this is exaggerated? Notwithstanding that this blog does encompass most of these things that Freese professes to hate, I tried to understand his point of view. Yes, I have seen blogs where reviewers are afraid to write negative reviews. Yes, I have seen blogs where there seem to be more posts about the blog's author than about the subject matter the blog was supposedly created for. However, the one argument that really grinds my gears (Family Guy reference) is the generalization that most bloggers do not appropriately appreciate literature. Before writing for this blog, I was unaware at the breadth and depth of blogs that are devoted to literature in all its forms. The staggering amount of discussion (educated discussion, no less!) that is present in these blogs that brings a new and revitalized look into the works of literary giants of centuries of old (Austen, Brönte, Hemingway, Wells, Dickens, etc) is astounding. These very blogs are what is driving a new generation to explore these works and read them anew. Yes, we may not ponder and mull the significance of every passing page with a fine toothed comb, but I argue that the spirited discussions that arise from these readings are just as important as the words printed in these novels. Therefore, after I began writing for this blog and discovering this underground (so to speak) network of literary criticism, discussion, and general celebration of the printed word, I was thrilled to meet so many other people who share the same thoughts and feelings as I have. That is the point of blogs, to connect those who would otherwise never be connected, whether it be by distance, time, or any other metric. Blogs have the power to do all this and more. Perhaps the best inheritance you can give to close ones is the way in which you lived, as opposed to how well you saved and planned. We cannot have it all, however un-American, during life, after life. What is obtainable is the intangible, if worked at- the imprint, the impression you make on others, perhaps what we mean as the soul. In a corporate state this has no value. So, choose. When I first read about this book, I got the impression that it would either be wonderful or terrible. Either the author would be intelligent enough that he could effectively and from solid ground “joust with American culture,” or he couldn’t and the book would read as a giant whine-fest that lacked credibility. As you can tell by my rating, he clearly has the brains to back this book up. Now, I didn’t agree with all of his essays, but agreeing isn’t the point. Where would the world be if we all When I first read about this book, I got the impression that it would either be wonderful or terrible. Either the author would be intelligent enough that he could effectively and from solid ground “joust with American culture,” or he couldn’t and the book would read as a giant whine-fest that lacked credibility. As you can tell by my rating, he clearly has the brains to back this book up. Now, I didn’t agree with all of his essays, but agreeing isn’t the point. Where would the world be if we all only read or listened to things we agreed with? Other times I agreed so strongly that I slapped the book down on the table in the break room at work and cried “Thank you,” or laughed at the accuracy of his sometimes extremely entertaining name calling. As I read I often wished Mr. Freese were sitting there next to me so that I could make counter points and discuss his views further. What better kind of non-fiction is there? This book doesn’t have a specific genre. The author discusses everything from generational problems in education, to human nature and living in the moment, to the horrid hypocrisy of book bloggers (and yes, I quite enjoyed that one!) Growing up, I spent many hours in philosophical, scientific and logical conversations about many of the same topics with my father. As an adult, often in conversation with others I will mention a concept, like the purpose and illusion of religion or the horror of a teacher who says “Don’t worry about that, it won’t be on the test,” just to draw confounded stares. I often forget that most people did not spend their childhood philosophizing late into the night, and I feel like many of the ideas in this book will be novel to them. If you’re one that likes to contemplate the world around you and question even the most basic assumptions…this book will spark all kinds of things for you to think about. But if you are one who DOES NOT take time to contemplate the world you live in…you NEED to read this book. It may very well plant a seed to help you grow in ways you never imagined. Let me caution you though – this is not a book to CONVINCE anyone. There are no lists of facts to support views, there are no step by step logical arguments. I honestly got the impression that Mr. Freese couldn’t care less if I believed him, and that is partially what made his book so compelling. His essays use emotion as much as reason to make his point, which at times annoyed me; not necessarily because emotion is bad, but because one must always be vigilant to ensure their emotions aren’t manipulated to a view point that does not actually make sense to them. (think of any politician’s speech…ever.) That distrust of emotional appeal may be as much a flaw in myself as much as the book, though. Most people LIKE emotion, and this will be a positive for them and help them relate to otherwise abstract concepts. The book reads like a piece of art. His writing is complex and tiered so that meaning upon meaning can hide inside the words for you to explore, and yet it reads smoothly. I generally take a long time to read non-fiction because every chapter or so I have to stop, process, take notes, think and otherwise LEARN what I have just read. I think I read This Mobius Strip of Ifs faster than any other non fiction book I have tackled, because it read artistically; not like a science book. It drew me in as any good fiction novel does. Was the grammar perfect? No. Were there misspellings? Probably, although usually it was hard to tell if a word was misspelled or just invented. These things didn’t matter though – it reads like a conversation, and he is very well-spoken. This book deserves more than one reading. I’m certain that in one pass I haven’t gleaned all or even most of what Mr. Freese has stored there for me. But instead of it being a chore, I am already looking forward to the time I read this book again…I’m willing to bet you will too. To begin with the book came across a pure rant by the author. A rant against the education system which churns out robots with no mind of their own who march into society to be a success (in material terms); a rant against a mother-daughter duo who while they did not overtly flaunt their wealth were the top bidders at an auction (the auction was to sell the assets of a rich couple who were divorcing each other) -- the author disliked the gluttony he witness as the economy especially in these par To begin with the book came across a pure rant by the author. A rant against the education system which churns out robots with no mind of their own who march into society to be a success (in material terms); a rant against a mother-daughter duo who while they did not overtly flaunt their wealth were the top bidders at an auction (the auction was to sell the assets of a rich couple who were divorcing each other) -- the author disliked the gluttony he witness as the economy especially in these parts (Nevada) was down in the dumps; a rant against bloggers turned book critics; a rant against an overbearing mother; a rant against an unethical therapist; a rant against his ex wife (this relationship had ended in a divorce)… The underlying current of the book was: I do not care what you think of my book – I’ve written it only for myself! This in fact was stated by the author in the chapter titled: A spousal interview (yes, his wife did interview him and even wrote a beautiful foreword). The unheard scream or screams resonated not only in the chapters which dealt with the failure of the education systems , one of the chapters ended with the use of this term, but the unheard scream resounded through-out the book, was quite high pitched at times and was quite painful to hear. Then the author went on to describe his foray and experiences as a therapist and a few of the essays dealing with his experience were interesting. In the chapter: Introductory remarks on retirement from a therapist, drawing on his experience, he states: “Few of us give as much energy to what we psychologically, spiritually and emotionally need…”What is important is how we have lived our life, as opposed to how much we have saved for our retirement. In another chapter titled “Ten Canon(s)” the author pends down ten tenets which could lead to a healing awareness. My favourite is: Self esteem is the scree, rock and earth at a mountain’s base. The author tells us, “Think of the essence you have, not what others say you are, or what societal lint you garner…” There were quite a few hidden gems to find in these chapters. The second part of the book began on a new note, in which the author’s admiration for literature and films came shining through. The author’s essay on Kazantzakis is what I liked best. We do have a choice to reach for what we can, or reach for what we cannot – and the latter makes our life much richer and as the author adds, also dearer. The essay, ‘Camera as remembrances of things past’ now only portrays the value of memories captured for eternity, but hints of the changing times. It is in the last part of the book that one gets to see the sensitive side of the author. He talks about the pangs which a parent feels when his child first steps into school, the evolving role of a father as his daughter begins to grow, the courage of one of his daughters who was suffering from Chronic Fatigue and Immune Dysfuction Syndrome and the emptiness he felt when she committed suicide. This book is not everyone's cup of tea. Amidst the din of words, there are quite a few nuggets of truth which need to be dug out and understood. Had it not been for the endless rant and I am better than thou attitude (which at least I could perceive - but perhaps I've misunderstood) in the initial section of the book, I would have given the book a much higher rating. I would have ideally given a rating of 2.5 but half ratings are no longer permissible on GoodReads. The author is truly a master of words and he has opened my eyes to many new authors and films. Perhaps you may enjoy the book, better than I did. An update is that the book has recently won the National Indie Excellence Award in the non-fiction category. How does one summarize an entire life of more than 60 years? When faced with this ominous task, too many self-published writers produce rambling, episodic narratives that fail to capture the true drama and beauty of their lives. Fortunately for author Mathias B. Freese, he is a gifted essayist who has been writing essays for decades. By collecting his favorite pieces, he gives readers insights into both his personal life (which is, sadly, full of tragedy) and his views on such topics as educatio How does one summarize an entire life of more than 60 years? When faced with this ominous task, too many self-published writers produce rambling, episodic narratives that fail to capture the true drama and beauty of their lives. Fortunately for author Mathias B. Freese, he is a gifted essayist who has been writing essays for decades. By collecting his favorite pieces, he gives readers insights into both his personal life (which is, sadly, full of tragedy) and his views on such topics as education, psychotherapy, blogging, and, of course, writing. The book, as a result, is one part personal memoir and one part intellectual analysis. It is a harsh read. There are works like those of Freud’s, scientific and calculating, cautious even. There are works like Paulo Coelho’s, which give you deep mantras in sugar coated easy to read stories. And then there is this man, who calls a spade a spade, and gives you facts and truth to your face. He is critical of people, of habits, of the system, of the world around him. Above all, he is critical of himself. He was a therapist; therapists have issues too! A book that begins with a quote by Hemingway can hardly go wrong in my eyes! I once read Freud, a lot of him, I liked frequent references to his work. On the other hand, I didn’t enjoy the references to other things as much, ones I did not know about… “How will I ever read so much! ?” reads my note to self on the margin. Reading a lot of the essays made me feel like I was encroaching into really personal territory. I wasn’t sure if I wanted to read on. Did I really wish to know? I don’t know how much courage and general faith it takes to bare to the world… Also, the essay on bloggers made me ask questions as to my own purpose… Why do I blog? Why about books? Am I a true critic? Am I needy? If so, aren’t we all? A book that makes you introspect is, in my opinion, a brilliant read, challenging and scary, but worthwhile. With deepest apologies to the author for the tardiness of this post, I have put fingers to keys many, many times in an effort to review his book. Never have I felt so inadequate - had so much trouble finding the right words. Perhaps because I have never before read anything with which I connected on so many levels. This Möbius Strip of Ifs is a collection of essays, life stories, and personal rages against society, the educational system, religion, and therapy. Okay, bad therapists; not necessari With deepest apologies to the author for the tardiness of this post, I have put fingers to keys many, many times in an effort to review his book. Never have I felt so inadequate - had so much trouble finding the right words. Perhaps because I have never before read anything with which I connected on so many levels. This Möbius Strip of Ifs is a collection of essays, life stories, and personal rages against society, the educational system, religion, and therapy. Okay, bad therapists; not necessarily therapy. As a former-educator and former-therapist, I trust that Mr. Freese knows whereof he speaks. "Untidy Lives, I Say to Myself" explores whether we can truly find meaning in our existence. If such meaning actually exists at all. Or should our existential goal be "... contemplation without a scorecard"? The writings on the Holocaust: "On the Holocaust" and "Trains = Holocaust and Other Observations, Railfans" speak to my fear that we are all innately capable of such atrocities. And, probably most importantly, it isn't society that needs to evolve. It is the individual. Not everyone has a happy-happy-joy-joy youth. Many of us are raised by, and run the risk of becoming, defective parents. "The Seawall" shares - with all the warts - what it is to live an imperfect life in the shadow of an imperfect mother. Interestingly enough, my spouse has decided, having heard my review, that this is a book about nothing. To me, it's a book about everything. Each time I read it (four times, and counting), I find myself touched by something different. Disclosure of Material Connection: I received a complimentary copy of this book from the author. I was not required to write a positive review. The opinions I have expressed are my own. It’s not an easy task to review a book composed of essays, especially when they are as deeply personal as these are. However, I do want to share some of the thoughts I had. First of all, there is no doubt Mr. Freese is a writer at heart, and soul, and everywhere that’s important. His words, his phrases, are organic, the kind that seem so simple yet really are not. They have layers of meanings that deserve many consequent readings. Sure, there are a few moments where I found myself wishing he’d wh It’s not an easy task to review a book composed of essays, especially when they are as deeply personal as these are. However, I do want to share some of the thoughts I had. First of all, there is no doubt Mr. Freese is a writer at heart, and soul, and everywhere that’s important. His words, his phrases, are organic, the kind that seem so simple yet really are not. They have layers of meanings that deserve many consequent readings. Sure, there are a few moments where I found myself wishing he’d whittled some down to their bare bones, so that the truth in what he was trying to say could come through unencumbered, but these moments were few and far between. As far as content, the essays cover everything from Freese’s favorite movies to his views on philosophy. His thoughts on education, in particular, struck me. It was surprising to read, from a former teacher, all the faults many of us see in the educational system. I found myself nodding violently at the manner he describes his struggles with a society (a world, really) that abhors creativity and that finds anyone who doesn’t fit into their molds threatening. The candid manner in which he shares with the reader about his daughter’s illness and consequent death is heartbreaking in the way only truthful prose can be. This is not an essay collection for everyone. If you are looking for some quick reading that will entertain you for a few hours, then this is not it. This collection will make you think about everything around you until your head hurts and you have to put the book down. I enjoyed it very much, so I will recommend it to all of you out there who want something refreshingly, intelligently different. This Mobius Strip of Ifs is not a book for those who do not wish to think a lot while reading. This is a collection of short essays and memoirs by the author Mathias Freese. It is a very intellectual writing with a hint of emotion as well. I found each different essay to be interesting in its own ways. Reading through each one was thoroughly enjoyable. I find it hard to review books of this sort because they are all different. The writing styles are different, the subjects are different, and so This Mobius Strip of Ifs is not a book for those who do not wish to think a lot while reading. I find it hard to review books of this sort because they are all different. The writing styles are different, the subjects are different, and so on. So, I will say this. If you want to pick up a book that reads sort of like an intellectual diary, I would pick this up. Note that when I say diary, I am not lessening the effect of what Mathias has to say. I mean it in the way that he is the man behind each of these essays saying how he feels about different topics. Overall 4/5 stars I really enjoyed it, but a few of the essays lost me. Bound to happen I supposed. In system more reflective of the individual merits of each piece, rather than grossly averaging the value of each essay, Freese's collection of essays would vary widely in ratings. While The Unheard Scream deserves some four stars for its intrinsic curiousity and urgency, the rampant kyriarchy throughgout essays such as A Spousal Interview and Teachers Have No Chance to Give Their Best makes it difficult to rate the collection higher than two and a half to three. If you, dear reader, can overcom In system more reflective of the individual merits of each piece, rather than grossly averaging the value of each essay, Freese's collection of essays would vary widely in ratings. While The Unheard Scream deserves some four stars for its intrinsic curiousity and urgency, the rampant kyriarchy throughgout essays such as A Spousal Interview and Teachers Have No Chance to Give Their Best makes it difficult to rate the collection higher than two and a half to three. If you, dear reader, can overcome the pervasive existential whininess which occasionally overshadows individual essays, there are moving comcepts that will resonate long after setting This Mobius Strip of Ifs down.